The past 2 weeks were so manic for us. I've been staying in London for almost 2 years (3, if you include the 1 year I was here before going back to KL again to work & prepare for the wedding) and this is the busiest I;ve ever been! Since meeting Michelle & Kaka, and especially since Michelle got a car (yayy!).. the four of us have been going out alot during the weekdays. It was mainly for the two girls's benefit. What we did these 2 weeks. 13 Dec : Michelle & I went to Billingsgate Fish Market to buy fresh fish. We left at 530am! 16 Dec : Kaka came over to play during lunch - I made the kids's lunch while Michelle brought Pizza for us! 18 Dec : BY came over for lunch and "interview" for coursework. 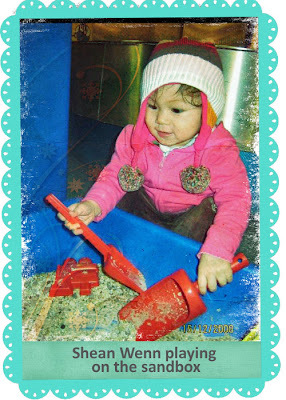 19 Dec : Messy Play at the local sure start centre, then off for lunch with the other moms. 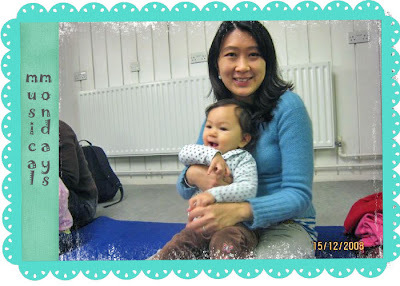 When we met another mom, Jessica (mom to XinYi) who is a M'sian, we had even more activities - some of them introduced to us by her. She then introduced us to her friend and neighbour Jenny (mom to a boy Matt & girl MayLin). 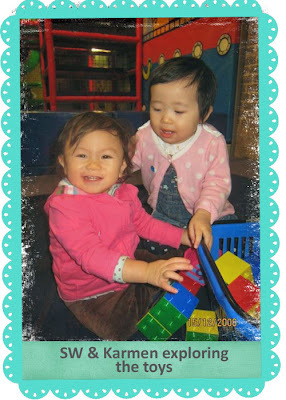 The other day, after our Messy Play, the four mothers, along with our five kids went for yumcha at a local chinese restaurant. Shean Wenn fell asleep in the car on the short 5 minutes drive there and I had to carry her WITH her baby carseat (she no longer uses this but I now use this to transport her in Michelle's car because it is such a hassle to install her toddler carseat) into the restaurant, and THIS resulted in a backache today. Shean Wenn woke up halfway through lunch and she happily ate whatever I put on her bowl. And then, I turned away for awhile and she stood up and grabbed the hot water teacup next to Michelle and started to pour the water! I quickly grabbed it away from her and luckily she wasn't hurt or burnt by the water. What a near-miss... obviously I got a big nagging from the hubs when I relayed this story to him. Must be ultra careful now. Especially when Shean Wenn is such an inquisitive and fast-learner! After their lunch, the older kids went down to play, running around the restaurant. The little ones looked on with envy and anticipation. I let SW down after she had finished her food and she happily ran around, playing with the other kids. I think she really enjoyed the company of the other kids. The five of them had so much fun in each other's company. Here are some photos taken during Musical Mondays at the beautiful Museum of Docklands. In the Mudlarks area : An area dedicated for kids under 5s. 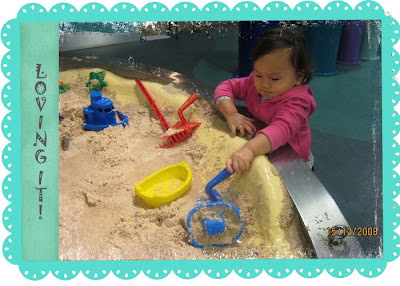 Shean Wenn spent a long time playing on their sandbox, and the sand/water/river bunk. 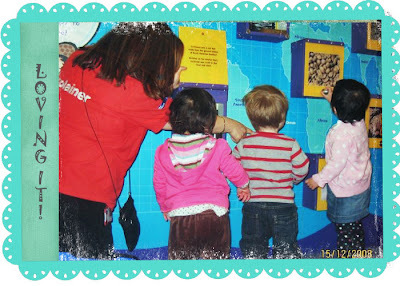 An "explainer" explaining about the various boxes in the mudlarks gallery to the enthusiastic kids! 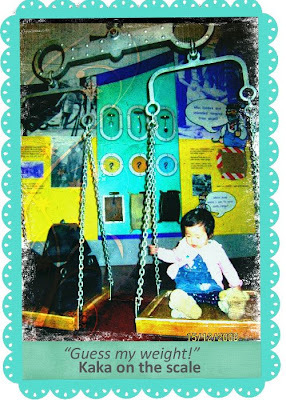 Karmen on the scale - how cute! 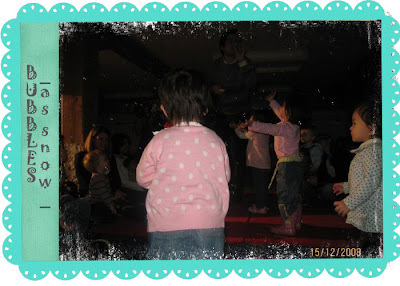 During musical time, the organiser blew bubbles (as snow) as he illustrates a Christmas tale... the kids were ecstatic! SW as usual, observed quietly from her place before deciding her next step - JOINING IN THE FUN. More photos of the kids's play to ensue (when I get it off Michelle because, poor me has no camera). Such a busy bee!!! 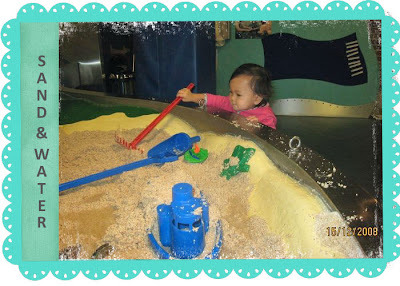 Love that HUGE water and sand pit.It's so ADORABLE how she watched from afar first, as if assessing the situation during the snow bubble session. Zewt : Eh, no no. I am not so irresponsible. Siew : Yes it is.. but now I am sick again. And I have to quarantine myself this time. 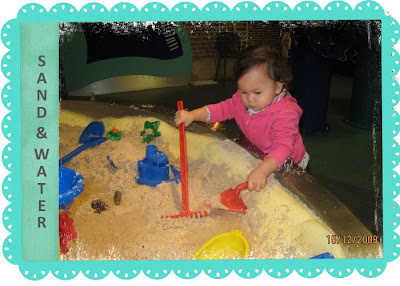 The picture of "SW playing on the sandbox" makes SW look so 'ang moh' don't you think? She look so much fairer, and her hair looks blonde?